Take off the note. 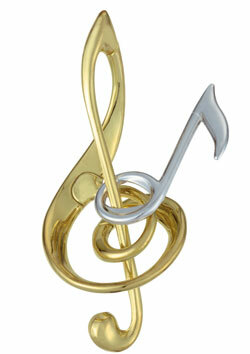 The “G clef” and “eighth note” intertwine and give off a beautiful note as if they’re playing music. The design, which does not resemble a puzzle at first glance, is beautiful to the eye as well as fun. Theme: “Playing music”. 2010 Nob Yoshigahara Puzzle Design Competition Puzzler's Award och Jury First Prize. Designers: Russian Dmitry Pevnitskiy and Kirill Grebnev. Level 2/6. Dimensions: 7,5 cm x 11,5 cm x 4,5 cm. This product was added to our catalog on 14.02.2013.